The Langhe and the rolling hills of this territory are like nowhere else. I find this to be a place of great peace and tranquility, ones soul seems quite restored after even the shortest of sojourns. We are lucky enough to have found a few splendid hotels and the like in the area to which we retreat with increasing regularity and hopeful we may well be fortunate enough to retire here one fine day. There is one hotel in the Langhe which is rather special and it is indeed the best of the many we have visited. It is the Antico Podere Tota and I would seriously recommend you visit. I would love to hear your opinion once you have visited and I am sure you will find it to be quite the most delightful hotel. Andrew's reply: I know the Antico Podere Tota Virginia well. 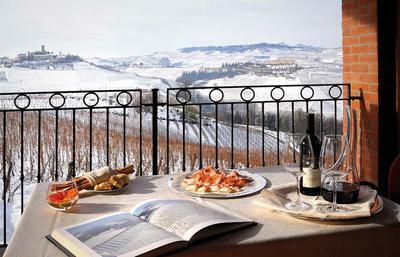 It is in a beautiful location and is an excellent base to explore the Langhe. 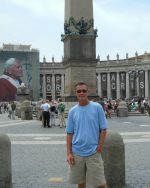 In fact just today another site visitor asked me about the place and really I have no hesitation in recommending it. In fact you can't help but fall in love with the place once you've visited! Join in and write your own page! It's easy to do. How? Simply click here to return to Stayed Somewhere Special?. My husband and I stayed for three nights at the Cascina Corte in Dogliani in the Langhe Hills during the earlier summer this year. We could not have been happier with our choice: a gorgeous room with modern, spacious bath, an all organic breakfast, and a wonderful family, the Barosis, to mingle with. The hilltop location and the variety of excellent restaurants in Dogliani from which to choose for dinner were a bonus. This site of the hotel is only about one hour, via the Autostrada, to the Italian Riviera also. Thank you very much for the review. The Langhe really is a lovely part of the world isn't it and finding wonderful restaurants to eat in is never difficult. In fact it is one of the few places on earth where finding a bad restaurant is just about impossible. Great food and wine, wonderful people, ancient and well preserved villages combined with unforgettable scenery should make the Langhe one of the most popular destinations in Italy. Thankfully though relatively few tourists have yet discovered it. 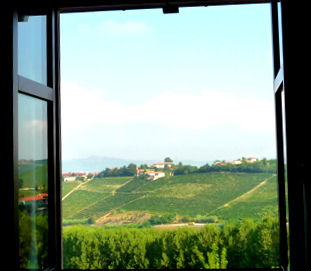 To bring back a few memories of the Langhe for you I have attached a favorite photo of mine taken from the Villa Lauri in Neive. I don't know if you visited Neive while you were in the Langhe. If you didn't then you have something to look forward to on your next visit. It was recently voted as one of the loveliest villages in Italy by the official Italian agency that evaluates such things.